Where is the “Golden Mile” of fly fishing? Well it’s right in the heart of Golden just minutes from Denver. The Golden Mile stretches along Clear Creek from Jefferson County’s Grant Terry Park to Vanover Park at 10th and Ford Streets in downtown Golden. The Golden Mile is the result of a 2009 project by West Denver Trout Unlimited to create a first class trout habitat in Golden. 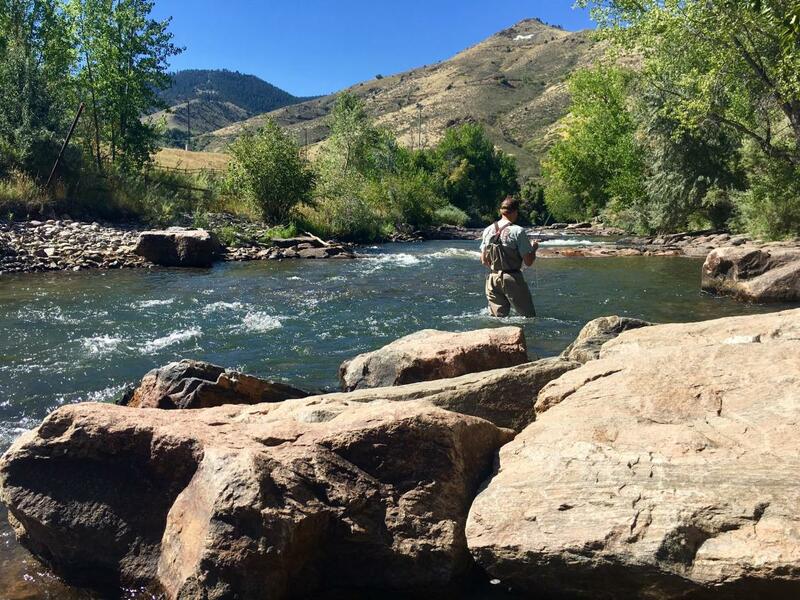 Everything fish love was taken into account and fish flourish because of the depth, pools, current breaks and other features, and that means good fishing for fly fishers in Golden. Brown trout predominated, but there are brook, cuttbow, cutthroat and rainbow trout too. Whether you have a few hours or the whole day these golden waters are prime and within walking distance of two licensing agents: Meyer Hardware and Golden River Sports, so you can purchase your fishing license and gear and dive right into a quality urban fishing experience. Golden River Sports offers fly fishing classes, clinics, and guide trips as well as some great deals like free fly line cleaning and a Wednesday night free fly tie where you can bring your own stuff, hang out and tie up some bugs. FYI, don’t miss the first full weekend in June when you can fish in Colorado without a license.